Teams quickly learn that in order to win, you have to work and plan together. Communication, trust, strategic planning, leadership, time & resource management, flexible problem solving, and adapting to a changing battlefield are all involved in winning a Skirmish match. Senior staff members lead team building exercises staged at our 750 acre world-renowned Skirmish Paintball facility. 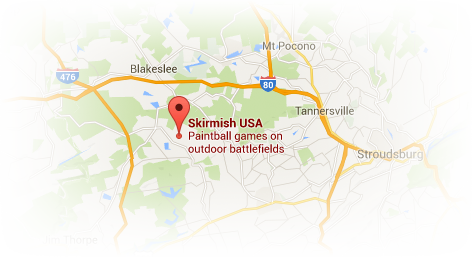 Skirmish paintball games can be arranged with great flexibility. We will gear the paintball play to your needs; adjusting the number of games played, format of play, and time spent on each game. We realize that paintball team building begins with respect for the individual and their skill level. At no time will any member of your team be asked to participate above their comfort level. 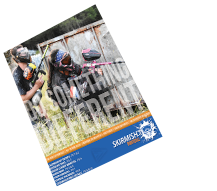 Why Choose the Skirmish Paintball Teambuilding Package? We will create a customized itinerary! Want to battle it out all day or only for a few hours? Looking for instruction on how to improve? Want to discuss keys to success or just want to play? You tell us and we are happy to cater to your needs! Facilitator Provided– Whether you want teambuilding drills, advice or just to play, a facilitator will be with you for the entire day as well as referees to ensure fair play. End of day bonfire to allow time for teammates to compare stories and debrief from the day! Want to provide more food for your team? Food packages available! Skirmish Paintball has breakfast, lunch and dinner packages. If there aren’t photos did it really happen? Action packages available where our photographers will join you on the field and take photos of you as you battle it out with your teammates! Transportation packages available from all local resorts. Call 1-800-WHITEWATER (944-8392) for bus company and resort information. Prefer a teambuilding activity that doesn’t involve getting shot? We also offer teambuilding packages with our two sister companies Pocono Whitewater and Pocono Biking! Give us a call for more details at 1-800-Whitewater! You must have advance reservations for paintball teambuilding. Please call 1-800-SKIRMISH (1-800-754-7647) and ask for Debbie Y in group sales at extension 114. She would be happy to help plan your team outing. There is a minimum of 10 players required to book a Skirmish team building program. Lighter or more advanced teambuilding programs are available and will be quoted based on the amount of customization. Breakfast, lunch and dinner packages are available upon request. Pocono Whitewater Rafting Teambuilding programs are available.